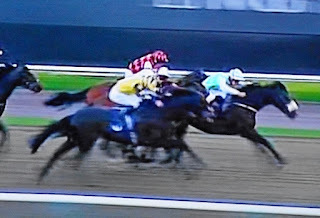 Breden continued the yard's good form this evening in a class 3 mile handicap on the all weather at Lingfield. Robert Winston jumped him out towards the rear and kept him there, but in touch, until the turn for home. Unfortunately the gap closed on him as he started his finishing sprint and he had to get going again. He was finishing fast, but the line came too soon and he was placed third in a four way photo finish. The first, second, third and fourth were each separated by a head. Breden, in the red colours, approaching the line. What a great way to spend a sunny spring morning. 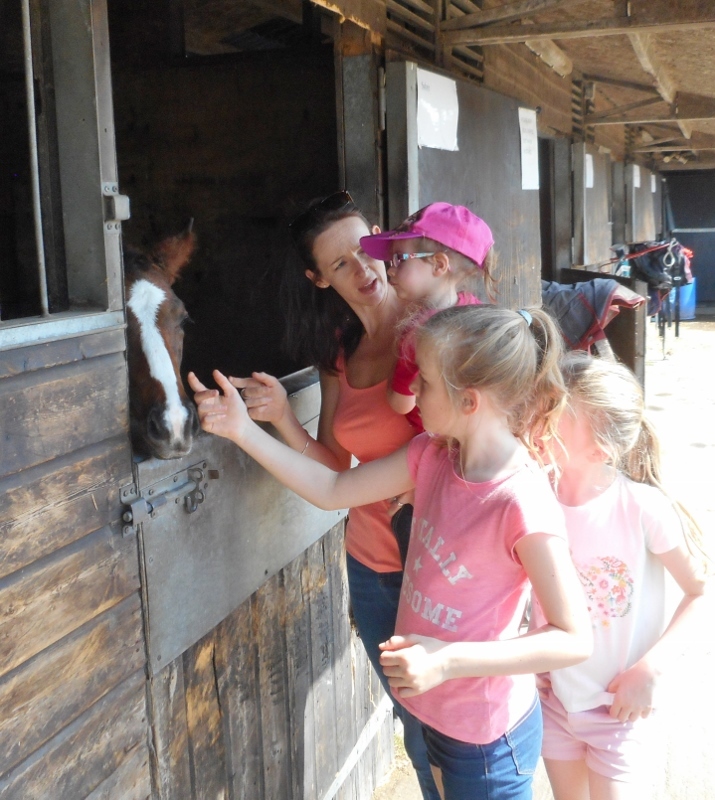 It was a beautiful day at the stables this morning and many owners old and young enjoyed being outside with the horses, after a lovely breakfast of course! Fun In The Sun And One Won! The sun came out, the ground dried up and Linda and the team had a great time at Fontwell. 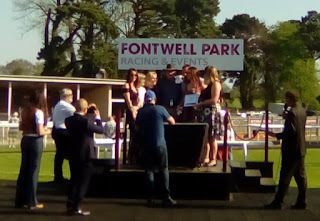 At last the ground had come right for Mab Dab in the 2 mile 6 furlong handicap hurdle. Tom Cannon, who had already ridden two winners on the card, was the jockey and he had Mab Dab close up behind the leaders on the outside. He jumped well throughout and maintained this position as other runners dropped away. 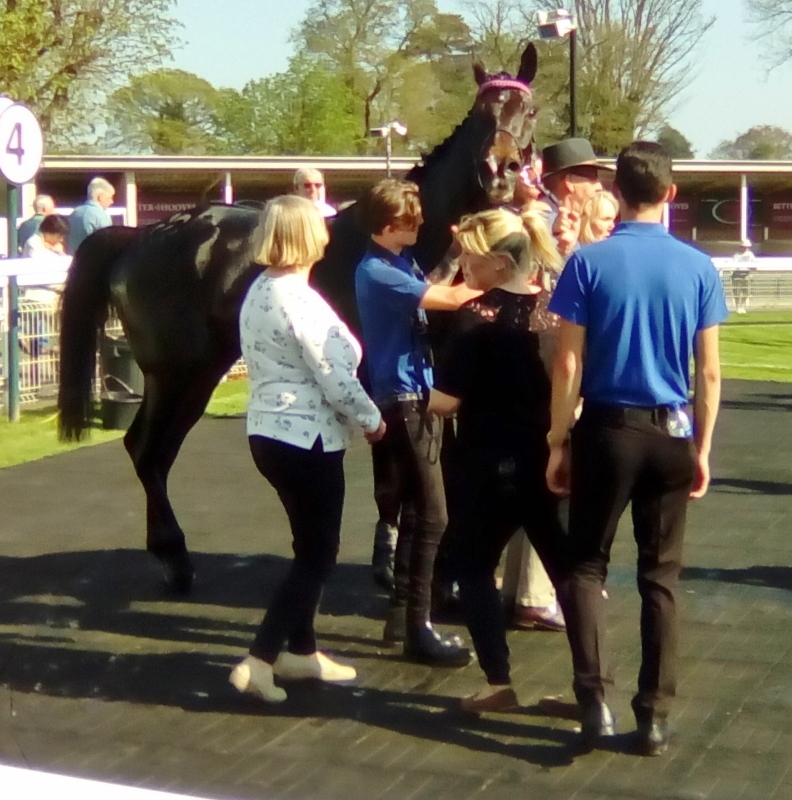 He held second place rounding the bottom bend for the final time and pulled away up the home straight to win by 8 lengths and giving the yard a great boost into the bargain. 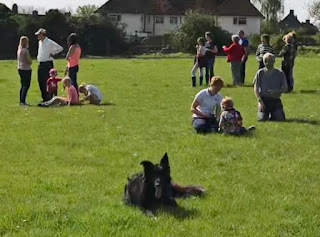 This was Mab Dab's second "win" of the afternoon as he had also won the "Best Turned Out" award for Oliver. Mab Dab has that "Haven't I done well look" with connections after the race. 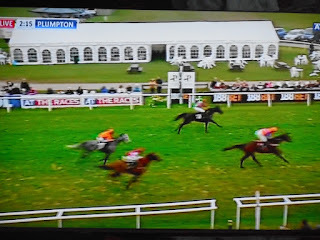 Earlier in the afternoon Wontstopmenow had his first race over hurdles. Ridden by Jack Sherwood he raced on the outside of the field to get a good sight of his hurdles. He jumped well in the main though was careful over a couple, especially as he had the attention of a loose horse for much of the race. He remained in touch until the bottom bend where more experienced rivals pulled away. Nevertheless he kept going to finish 6th of the twelve who started this novices hurdle and did more than enough to suggest he can have a successful career in the game. 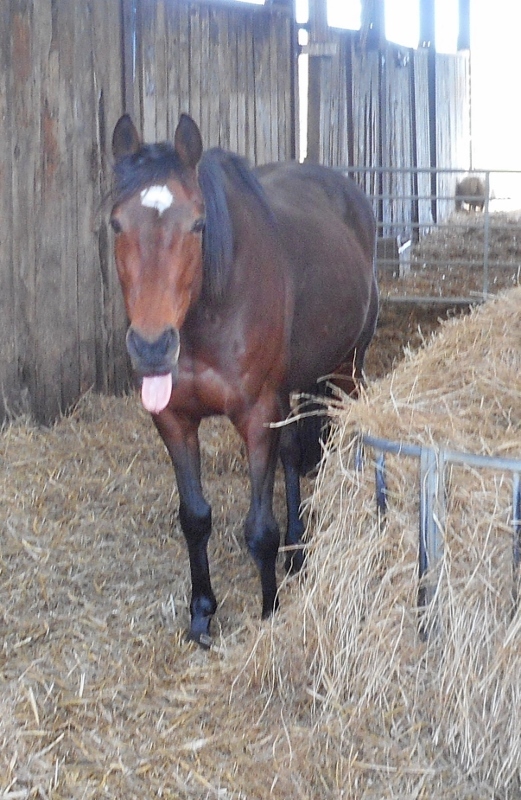 Like Mab Dab he also notched up victory for Oliver in the "Best turned out" award. Wontstopmenow goes out for his first ever hurdle race. Cockney Seagull also raced in the novices hurdle and was in the front two for a large part of the race before fading in the heat and being pulled up. 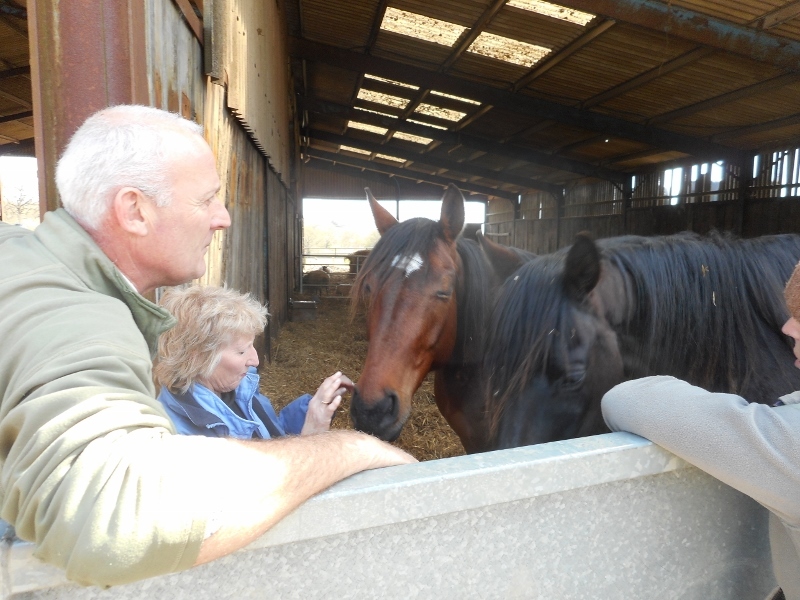 Today Linda went to Sussex with some of her owners to visit some horses that were recuperating after injury. The farm they are on looked lovely and they will soon be out in the fields eating fresh grass after wintering in the barn. Pauline strokes Due South with Royal Concorde nearest. 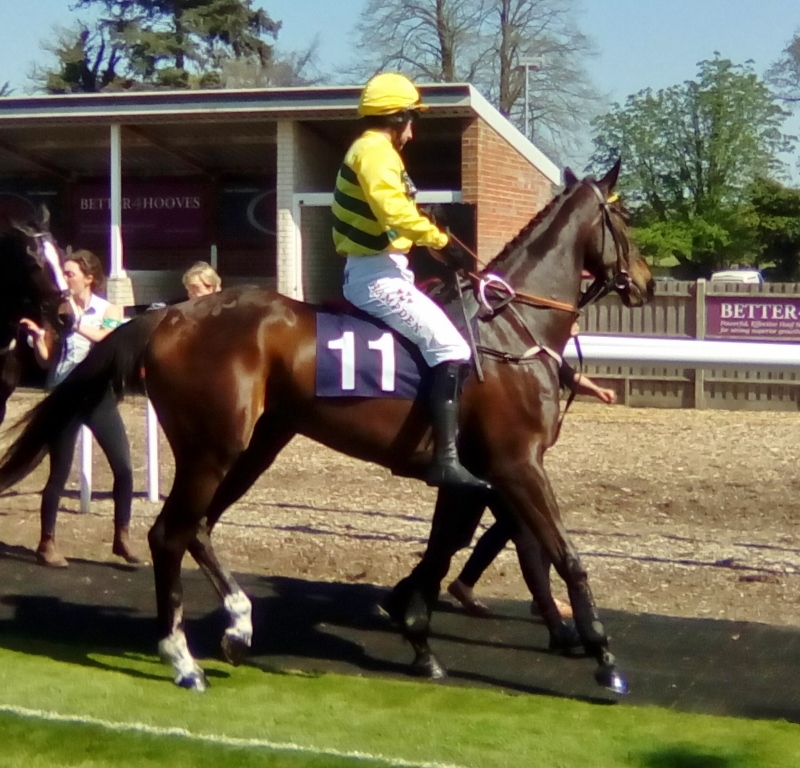 Mr Jack built on his fourth place last time out by finishing third in the 2 mile novices hurdle at Plumpton this afternoon. Ridden by Tom Garner he raced close up behind the leaders in midfield of the 11 runners. He started his effort around the turn past the railway station but had his least fluent jumps at the final two flights. 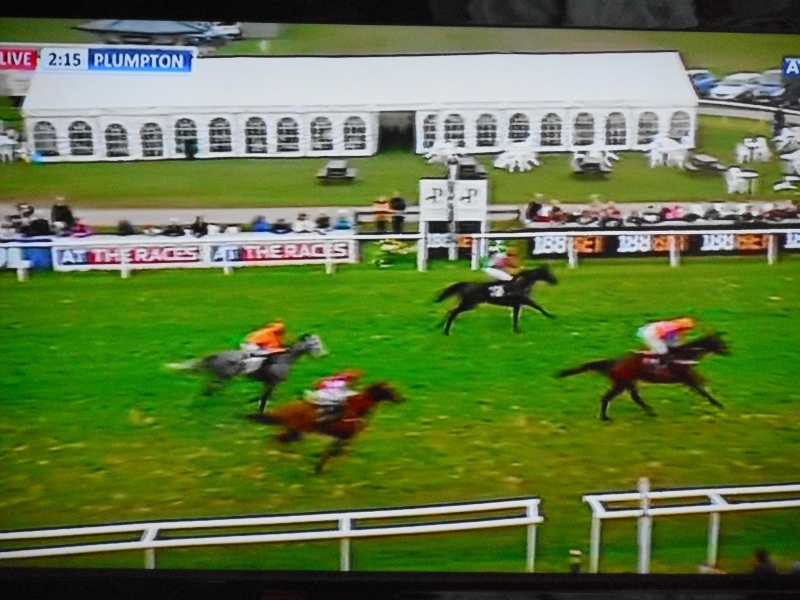 Nevertheless he kept on after the last to take third place, just 2 and a half lengths behind the winner. Mr Jack crosses the line in third place. The sun was out today at last which made a nice beginning for a foal born last night. Though not a racehorse foal it brought great pleasure and a buzz to all at the yard.